Utagawa Kunisada/Toyokuni III (1786-1865) Ichikawa Danjuro VI as Kakogawa Honzo from the series known as Actor Portraits Past and Present (Konjaku kabuki meiyu) 1860. Oban. The set was originally scheduled to include 150 works by the leading designer of actor prints, Utagawa Kunisada unfortunately, it was never completed. Only 72 published designs are known, with 12 by Yoshitora, plus two proof prints and two preparatory drawings, for a total of 76 known compositions. Yoshitora joined the project in 1862 for unconfirmed reasons (possibly to assist an overworked or ailing Kunisada). The series was intended to be the crowning achievement in Kunisada's career, with no effort or expense spared in its size or production… In terms of their quality (beautifully executed block cutting, exceptional colors, embossing, and burnishing), the prints from this series are reminiscent of the deluxe limited editions produced in the smaller chuban format in Osaka during the mid-nineteenth century (most familiar among them are the prints of Hirosada). The actor Danjuro VI is playing the role of Kakogawa Honzo, a minor character in the Chushingura - the stage adaptation of the Loyal 47 Ronin. It hardly matters - the force of this extraordinary image makes the subject almost irrelevant. 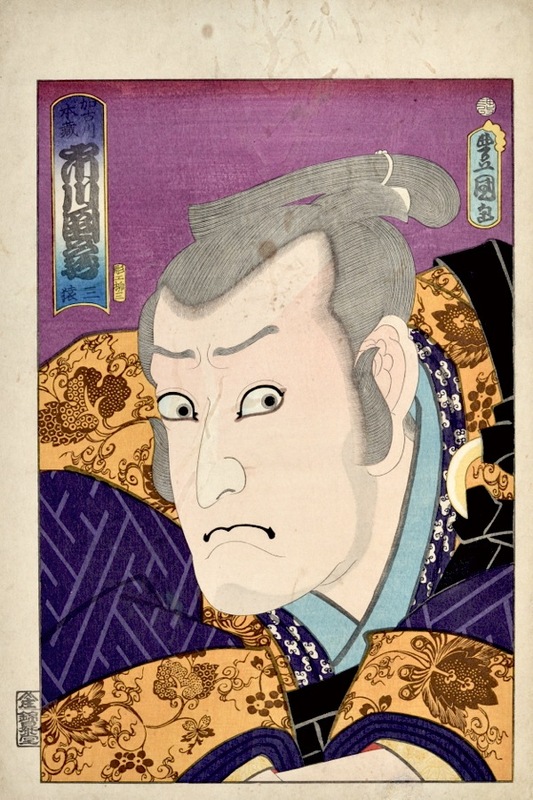 For another view of the subject we also have a different late portrait of Honzo by Kunisada. A magnificent print, full size with complete margins, exceptional block cutting and print quality, pristine colour and impression. The condition is very good except for surface soiling on the top margin and in minor areas. The title cartouche contains his pen name San’en. Signed Toyokuni ga; published by Ebisuya Shoshichi; carver Hori no Ryusan.